When I first started out as a journalist, it was common practice for me to just sit and stare at a blank screen, as if waiting for divine inspiration to strike me. I kind of knew what I wanted to write, sometimes I had a vague idea – but I didn’t know how to start or what I was really going to say until I was really in the moment. As if by magic, I would just suddenly get this idea and I’d get into flow, churn out all these words, writing until my heart’s content. That was great! Well, when it happened, but when it didn't, I just sat there – wasting time, chewing up energy not really achieving anything. What I learned was that this kind of process – this kind of ‘organic writing’ that I quite often hear people describe it as – can only get you so far, for so long. Writing naturally, when the inspiration takes you, seeing what comes up, is just not sustainable. Here's why. Just do a quick recap and assess how often do you actually feel like you’re in flow? How often do you write like you've been possessed? How often does the inspiration 'just arrive' and then you produce this amazing piece of writing? Because for most people it is not that often – it's great when it’s great, and it’s crap when it’s crap. There is reason that professional writers everywhere – a journalist writing a news article, an author writing a business book, or a PR person writing a media release – follow a framework. They have a structure that they use to save themselves a considerable amount of time, to prevent themselves from writing off-task and off-track, from writing something no one is going to read. 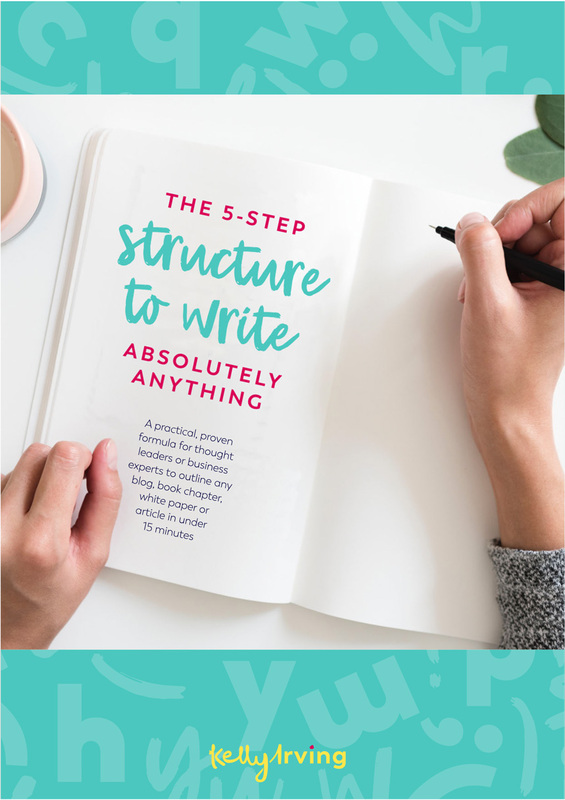 These structures are all designed not just to benefit you – the writer – but also to benefit your reader. We’re time poor today, we want our information quickly, we want people to get to the point. Yet, we also want to be engaged, entertained, to feel heard and understood – we want it all! And we want it all quickly, otherwise, we get bored and move onto the next thing. That's why clarity of you message is so important and that’s what a structure is good for – whether it’s for a blog post, book, white paper, even an email. So while organic writing is awesome for just going with the flow and having an authentic voice, it's just as important to marry that with a logic behind the emotional pull. 1. What is the main message of whatever it is you are writing? 2. Why is it important your reader cares? 3. How do they implement a change into their own life to make it better? They are pretty simple and straight-forward questions, but they can save you a considerable amount of time AND help you sell your idea, your message to your reader in a much more succinct and impactful way.